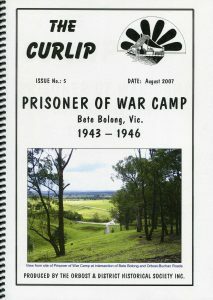 As well as book publications, the Orbost & District Historical Society publishes NEWSLETTERS which are actually short publications on numerous local history topics. These can be viewed as PDF files on this website. Documenting the distinctive slatted barns of the lower Snowy River, Orbost, Australia. Graham R Dyce, 2009, 144pp. ed. by John Phillips, 2007, 28pp. 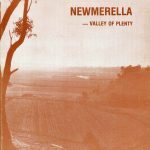 NEWMERELLA, Valley of plenty, history of Newmerella to 1978, 80pp. 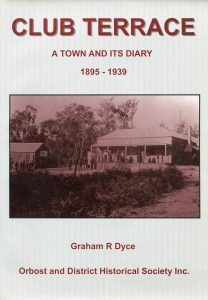 Compiled by ex-school principal, Harry Grosvenor, this book presents many photos and stories of the social history of the Newmerella district: farming, settlement, the school, sporting groups, the Aboriginal community, floods and disasters, the railway, sleeper cutting and much more. 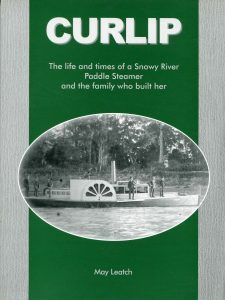 CURLIP, The life and times of a Snowy River paddle steamer and the family who built her, May Leatch, 2008, 100pp. This book charts the Richardson family from Surrey in England, to Geelong in Australia, to the goldfields of Ballarat, and then as pioneers to the Snowy River district in the 1870s. This energetic family became sawmillers and farmers, and builders of the Paddle Steamer Curlip. 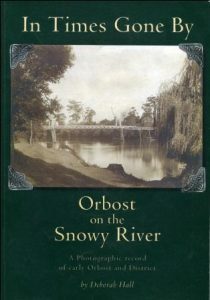 IN TIMES GONE BY, Orbost on the Snowy River, A Photographic record of early Orbost and District, Deborah Hall, 2002, 158 pp. 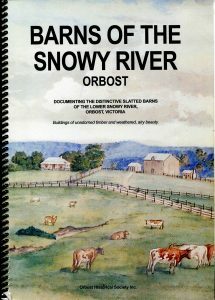 Compiled by Deborah Hall, this book contains a wealth of historical photos of the Orbost district. 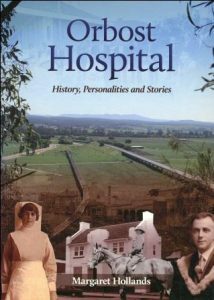 ORBOST HOSPITAL, History Personalities and Stories, Margaret Hollands, 2010, 213 pp. 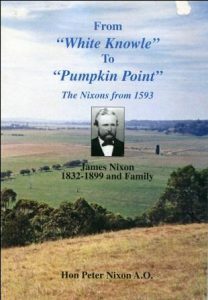 FROM ‘WHITE KNOWLE’ TO ‘PUMPKING POINT’, the Nixons from 1593, James Nixon and Family, Hon Peter Nixon A O, 2004, 80 pp. Peter Nixon charts his family from the 1830s at White Knowle, Cheshire, to Australia and ultimately to Pumpkin Point on the Snowy River near Orbost where the Nixons were early settlers. 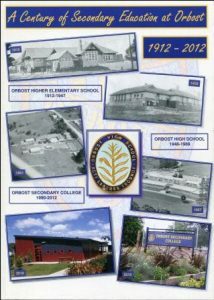 A CENTURY OF SECONDARY EDUCATION AT ORBOST 1912-2012, compiled by John Phillips, 2012, 150 pp. The beautifully researched and presented book of the history of Secondary education in Orbost. This is a MUST HAVE for students and teachers. John Phillips has been able to draw on his own personal archive as an ex-teacher at the school. EAST GIPPSLAND ANZACs A tribute to all those who served in World War I, Heritage Network of East Gippsland, 2016,156pp + CD. 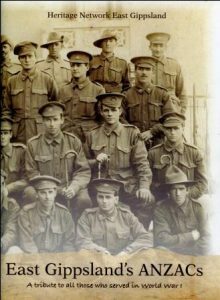 This memorial compilation contains a selection of stories from those who served, along with a CD of the names and service records of all of those known to have enlisted from East Gippsland.